startup spotlight Should we offer our product in various forms/ sizes, or should we stay with the original version until the product is well-known and has a strong customer base? J.M. : When I started John Wm. Macy's CheeseSticks in 1985, we were truly a one-product company. We stayed that way for the first four years, not because of a calculated marketing scheme but because I couldn't manage to produce and keep up with orders for more than one product in our small storefront. Looking back, that default plan worked for us because a single product was less imposing for spe- cialty stores to try than a full line. In the case of BuzzBars, retailers are going to be more willing to try to feature line additions once the lead product has established a following. Be sure that second product is a worthy addition to the line! When I finally did get around to a second retail item after a few years, I started selling it while it was still an unfinished work in progress and that dented the reputation of the company, just a little. A third consideration is that brokers and distributors always like to see new offerings as the product gets established. There might be some advantage to work in the most promising of the prospective line additions over the first two or three years of the company's existence rather than all of them from the get-go. How do you determine how much money to spend on your marketing and where to use it? D.D. : How much to spend is relative to expected results and invest- ment tolerance. Generally speaking, I have a ratio of incremental rev- enue to dollars spent of between $0.75 and $1.50. Given that range of incremental revenue to spending, you can establish a spending rate that fits your investment tolerance. Now on where to use it, I have two thoughts: concentrate and core. Concentrate because fragmentation kills, so you must con- centrate you spending/activity. Core refers to the brand essence: your archetype consumer, targeted geography, and channel. You want a more tightly positioned brand combined with a razor-sharp and com- pelling consumer proposition delivered as close to the brand choice as possible in terms of situation and location, offered as frequently as your budget affords. Before launching BuzzBar, Freeman, the managing member of the Los Angeles–based company, had spent more than 30 years in the music industry as well as creating marketing campaigns for the tech world. Co-founder Sassoon, the son of hair-care mogul Vidal Sassoon, had developed retail salons, training academies, and consumer hair-care products, and even had a few Sundance Film Festival award-winning films under his belt. While both have plenty of experience in marketing products, BuzzBar is their first foray into specialty foods. In less than a year, however, they are already working with 19 wholesalers and 500 retail customers and strive to go international quickly. The company has garnered press ranging from "Access Hollywood" to the New York Daily News. Here, Freeman asks a panel of experienced producers about growing the business. What are the obstacles to selling a product that contains alcohol? A.M.: Selling any savory or sweet food with residual alcohol can be tricky but very possible, of course. Each state has its own rules and parameters for what is allowed pertaining to alcohol in food products, ice cream allowances, chocolates, other desserts, and con- diments. There may, for example, be different restrictions for ice cream/sorbet with alcohol in Wisconsin than there are in California. The limit in one state might be 2 percent and in another 5 percent, and labeling requirements might be different as well. You should contact the FDA for each state, and they may direct you to the Alcohol Board in the particular state of interest. A bit of research and time will be needed to determine how the rules apply to your specific product in each state. You may conclude that there are particular states where the alcohol limit on your desserts is eas- ily within limits, labeling requirements manageable, and placement allowances wider. You may decide to create a dessert item with an alcohol content that better matches the majority of state parameters. 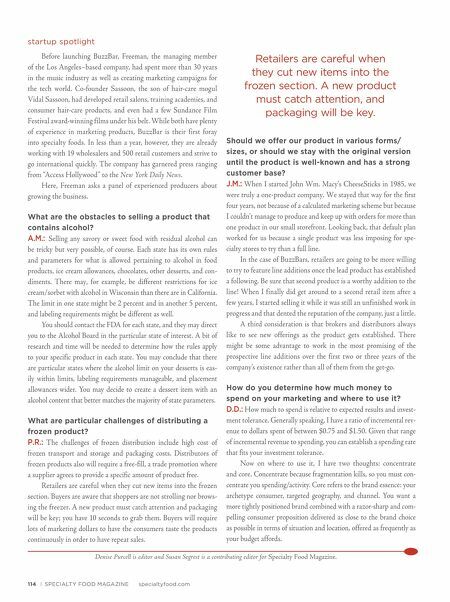 What are particular challenges of distributing a frozen product? P.R. : The challenges of frozen distribution include high cost of frozen transport and storage and packaging costs. Distributors of frozen products also will require a free-fill, a trade promotion where a supplier agrees to provide a specific amount of product free. Retailers are careful when they cut new items into the frozen section. Buyers are aware that shoppers are not strolling nor brows- ing the freezer. A new product must catch attention and packaging will be key; you have 10 seconds to grab them. Buyers will require lots of marketing dollars to have the consumers taste the products continuously in order to have repeat sales. 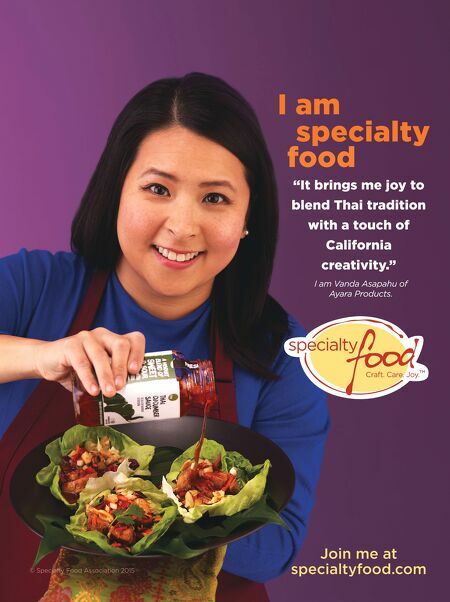 Denise Purcell is editor and Susan Segrest is a contributing editor for Specialty Food Magazine. 114 ❘ SPECIALTY FOOD MAGAZINE specialtyfood.com Retailers are careful when they cut new items into the frozen section. A new product must catch attention, and packaging will be key.